Landmarks were destroyed, the skyline is different, and streets are shifted in a way that feels same-not-same. It’s like having dinner with a relative you met once, when you were nine: as in When Brooklyn Was Queer, by Hugh Ryan, everything and nothing is familiar. Once upon a time, Brooklyn was little more than farms and fields. That’s the vista Walt Whitman saw when he stepped beyond the boundaries of the city where he’d been creating his Leaves of Grass. He loved the area, a love he shared with laborers, prostitutes, and the rest of the crime-ridden, mostly-white population of Brooklyn in the mid-1800s. As a gay man, Whitman would have noted upcoming changes. In 1883, the Brooklyn Bridge opened, making it easy for residents to reach New York City. There, male and female impersonators found work at live entertainment venues where race mattered little; and sexes and social classes mixed freely at saloons, concert halls, dancehalls, and theatres. For African American actors, that relative permissiveness led to more acceptance and sometimes, fame. By the time Brooklyn merged with the Bronx, Queens, Manhattan, and Staten Island in January 1898, a new word had emerged. “Homosexuals” had been targeted by obscenity charges for quite some time by then but, though laws were created against them, they had a solid presence in mainstream society. Even so, says Ryan, most people didn’t learn much about homosexuals until World War I. 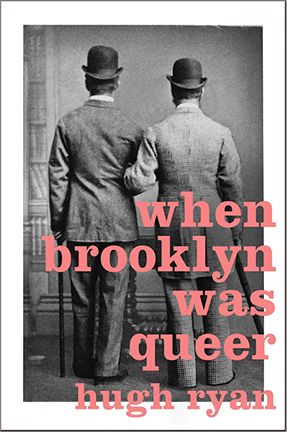 Reading When Brooklyn Was Queer is something like frosting a cake. From the starting point of a poet and a wharf full of sailors, readers glide smoothly to wood-floor dancehalls, sweeping near audacious lesbian actors, scandal rags, legal fights, burly-Q stages, then to the Jazz Age and beyond. Each spot is covered, sprinkled with asides, personal anecdotes from author Hugh Ryan, and modern references to create connections, then gently folded into the next subject. What may delight readers the most, though, is in the details. While this is a history of Brooklyn, specifically, and New York, in general, we’re taken to other cities and cultures to see how worldwide changes impacted Brooklyn’s residents. Like the inner workings of a clock, tiny facts turn larger events that become part of a big picture for readers to see. Unlike many books, this one doesn’t ignore anyone in the LGBT initialism; all are mentioned here and given due diligence.